I was planning to make coleslaw a few weeks ago, but my usual recipes all sounded a bit blah. I love a good slaw with peanut or sesame dressing (good recipe here), and my MIL makes a lovely Greek slaw, but I was in the mood for something a bit different, so I turned to the interwebs, where I came across some interesting slaw variations, including a recipe for Curry Bacon Slaw. I decided to give it a try, minus the bacon. I had a bit of leftover masaman curry paste in the fridge (masaman curry paste is one of the few store-bought canned goods that we regularly have on hand; I usually don’t use the entire can when I make a batch of curry, which leaves some extra to mix into things (it’s great in sweet potato or winter squash soup)), and I decided to use that in place of the curry powder and cayenne (the masaman has plenty of heat for us). While I’ve entertained some fantasies about BLTs recently, finding a replacement for the bacon in the recipe was easy enough. I often top my slaw with toasted sunflower seeds (or peanuts for the peanut/sesame slaw). I started with my go-to sunflower seeds here. They work fine, but toasted cashews work even better. 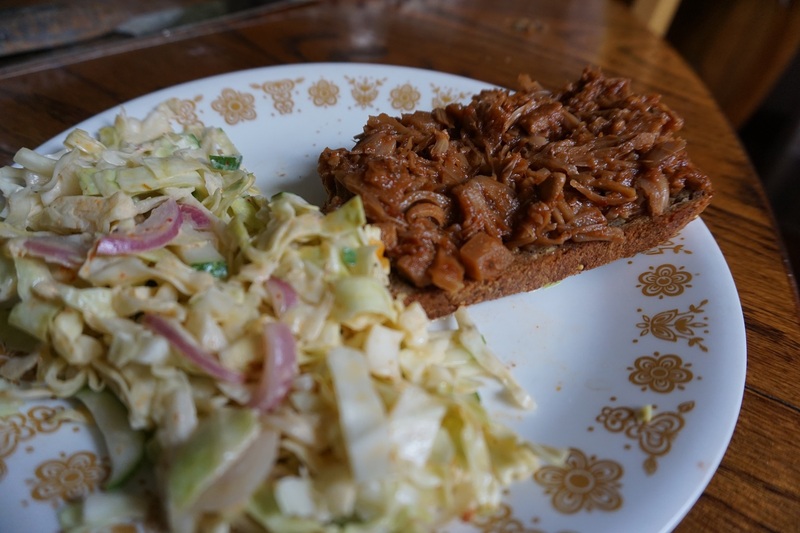 Note: In the above picture, the coleslaw is accompanied by my first attempt at a barbecue jackfruit sandwich, which will be the subject of another post. Now, on to the recipe! Whisk together all dressing ingredients to make a rich, thick dressing. Taste, and add more salt and/or curry paste if desired (at this point it should taste fairly salty, since the veggies haven’t diluted the dressing as all). Prep your veggies. I cut the cabbage by hand and use a box grater for the kohlrabi and turnips. Pour dressing over prepared vegetables and refrigerate at least one hour (2-4 hours would be even better) before serving. To serve, garnish with toasted cashews. Enjoy! This entry was posted in Food, Garden, Recipes. Bookmark the permalink.